Bone and Briar | Power. Desire. Manifestation. Trading morsels of comfort for other folks’ lives. Already, through shared articles, I see folks taking wee sighs of relief. I see people saying, “OK, maybe it’s not as bad as we think.” YES IT IS. Nothing has changed. Nothing! Come on, my fellow white citizens – Don’t let yourself be lulled into ease, into “oh, hey, I can live with that.” Don’t slip back into your comfortable white supremacist thinking. Sure, it’s what you know – and it’s just as wrong today as it was yesterday. Don’t lose yourself in it again. The articles being shared talk about the President-elect’s campaign promises that won’t come to pass – he won’t overturn the ACA, he can’t really build a wall, etc. What were you thinking? That he could build that wall? Do you know the size of the border? Do you know what’s at stake for those in power if it happened? The ACA, have you forgotten that Congresspeople only care about being re-elected and most citizens are for the ACA? They may want changes to the ACA, but they don’t want it repealed into the ether. How long have you been watching Washington? Broken promises aren’t new. Why are you relieved that campaign promises can’t be kept? Did you really believe all the things said to get your vote were doable? If so, you need to do a Google search on the history of winners’ promises coming to fruition by their own hand. It wasn’t the promises that got people to vote, it was the mindset that posited those things, the psyche that knew one could say any outrageous thing, any promise could be made, and if those promises said underneath that they’d uphold the old order, the status quo, people would gobble that up and vote. Now is not the time to be relieved some campaign promises can’t be kept – this is not news. This is one more tool to invite complacency, to let you know your life (your cis, het, white, able-bodied life) can stay mostly as is, while everyone else (again, again) has boots on their throats. Dear Gods, don’t be complacent. White supremacy is still here. It never left – not during the last 8 years, not during the last hundreds or years. Don’t allow your edge to be smoothed away by articles that want you to go back to being silent, ineffective, and a cog in the system. Please, please – stop reading and sharing those articles. Don’t let relief overtake your new vigor to fight the system. Stoke that flame of resistance! It is tiny, extinguishable by a thimbleful of water -do not allow it! Stoke those flames of change! It is the time to RISE, not sit. To keep our eyes open, to shout until we can no more, to stand with the disenfranchised and the marginalized. It is time to put our mouths, money, and bodies between the way it has always been and the world we want it to be! RESIST! I have never been a witch that worked with plants. I have been doing this witchy thing for almost 17 years, and I was never a witch that gardened or grew herbs. It just wasn’t my thing. But one of the fun things about being a witch is this: over time, your practices, interests, and magic shift and change. And, if you are an animist, the natural world reaches out to work with you. 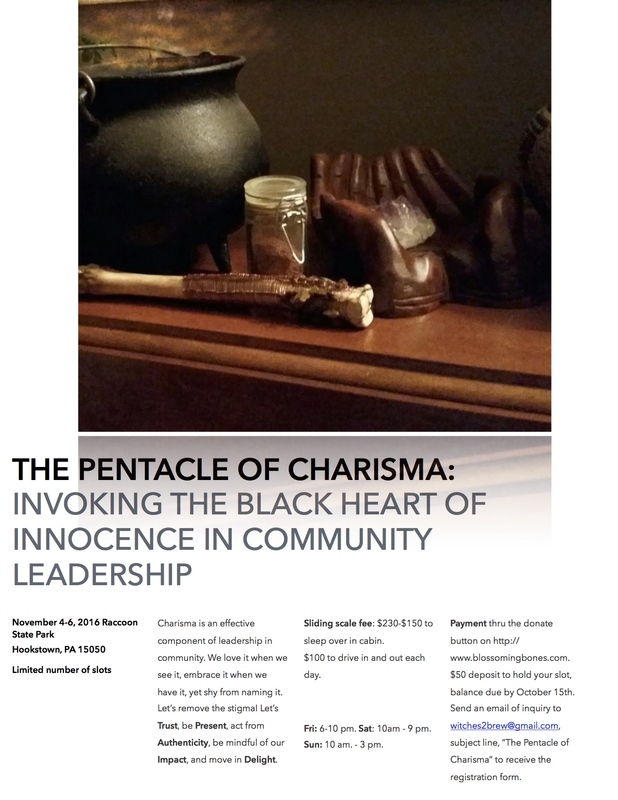 Charisma is a necessary component of effective leadership in community. People love it when they see it, embrace it when they have it, yet shy from naming it. Let’s remove the stigma, and learn the art of being charismatic through the Black Heart of Innocence. Let’s Trust, be Present, act from Authenticity, be mindful of our Impact, and move in Delight. Friday evening to gather and settle into the energy: 6p.m. – 10 p.m.
Saturday to embrace and work the points of the Pentacle: 10 a.m. – 9 p.m.
Sunday to discuss and begin to integrate the experience: 10 a.m. – 3 p.m.
Payment through the donate button on Blossoming Bones. $50 deposit to hold your slot, full payment due by October 15th. Send an email of inquiry to witches2brew@gmail.com, subject line, “The Pentacle of Charisma” to receive the registration form. In all the world, there will never be another just like you. You, one of the many facets of the Universe, your living Black Heart is a droplet of infinite stars. Unique just like everyone else, human and of the gods, we each have a handful of years to take our Self and offer it to Life. I say again: there will never be another just like you. We have all felt the gravitational pull of Leaders. Sometimes we call that pull “charisma”. Many times I have looked at someone who was particularly compelling, someone who was brimming with magic and thought, “I wish I could shine like that.” In truth, the desire I feel in those moments is this: I want to unlock my own unique wisdom to share with the world in service. What if charisma simply describes those moments of congruence when we tap into our personal wellsprings of magic and are able to share our essence with others? This is an invitation to befriend Trust, Presence, Authenticity, Impact and Delight – let’s use this pentacle to bring our gifts into the world, in service. Amoret BriarRose | I am a poet, witch, and synergist, and have been working Reclaiming magic for 16 years. I seek the sacred in words and woods, in song and silence, and in the intimate magics of the everyday. I endeavor to look life in the eye and believe that surrender holds a key to grace. I am called to divination, gathering messages from tarot cards and runes, from the sounds of tree roots stretching and the drumming of heartbeats. I am called to community, knowing that many hands make light and interesting work. I come alive when our voices come together, calling to the Mysteries. An itinerant Priestess at heart, I currently reside in Pittsburgh, PA, traveling to make sacred mischief. Find out more about me at http://www.amoretbriarrose.com. What happens when we are in the presence of charisma? For me , I fall in love. I fall for the very essence of who they are. My spirit is touched and reaches back to them in reciprocity. I am enthralled. I want to spend time with them. I want to soak up what they’re offering. I want more. When a leader in my community has charisma I find I want to be like them. I desire to have an impact as great as theirs. They inspire me to Trust in their Presence, to rise with their Authenticity, to welcome their Impact, and to squirm with Delight in all of it. I stand Black Heart open, receiving and wanting, each cell begging to return this precious gift to those around me. I want this. I want to give with my whole self those things of service that only I can bring, those things that would be missing from my community if I didn’t show up and offer them. Boneweaver |Chants, trance, and dance. I believe in the power of words, and particularly the power of words in song. I believe in the power of deep collective magic through sinking down, in and connecting outward to the all. I believe in the power of the body to move in rhythm with all the worlds, and I dance the borders between here and there, now and then, and life and death. I am a death-working, transition loving, Reclaiming/Feri Priestess artist. I talk to the Dead, and They talk back. I thrill to stepping off of that cliff into the unknown, trusting the process to carry me to my work. I work to build healthy community through intentional, compassionate, magic and ritual, near Pittsburgh, PA. Visit me at http://www.leanintojoy.org to learn more about me. Join us for our official kickoff of this new Pentacle! SAVE THE DATE – 1st weekend in November – A new Pentacle unveiled! November 4-6, 2016, near Pittsburgh, PA, Bone & Briar are unveiling a new pentacle! How do we dance between Authenticity and Responsibility? Charisma: what a loaded word! Come work a new pentacle with us, and explore this concept as it relates to leadership and community. Stay tuned for details!